According to English Heritage, during the Dark Ages, Tintagel was "an important stronghold, and probably a residence of rulers of Cornwall". Richard, Earl of Cornwall, built the castle here in the 1230's. They suggest that the site was "of no military value – legend alone seems to have inspired him to build here". Tintagel is shrouded in the Arthurian Legend. Gorlois, the King of Cornwall, sent his wife Igerne from Dimiloe to Tintagel to save her from the lustful Uther Pendragon. However, Merlin allowed Pendragon to appear as Gorlois to seduce the poor woman. It was from that act, that Arthur was conceived. It is Arthur's shade that is said to haunt the ruins of Tintagel Castle, whereas the ghost of Merlin is said to haunt the cave below the castle that is named after him. Pictured left is Tintagel Castle courtesy of IDS.photos. 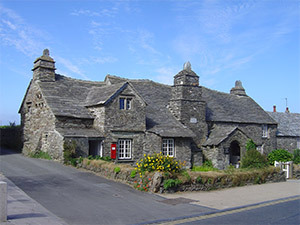 According to the National Trust, whom acquired this property in 1903, this "unusual and atmospheric 14th-century yeoman's farmhouse" is the Trust's first built property in Cornwall. The name dates from the Victorian period when the building held a licence to be the letter receiving station for the district, albeit briefly. 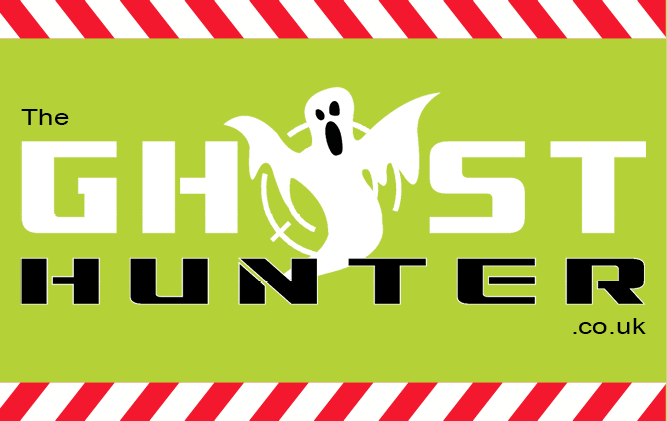 The building is believed to be haunted, with one member of staff experiencing electrical interference to the lighting, to such a degree that she deduced that there was a pattern to the flickering. A visitor to the property has reportedly seen an old lady in the bed. Pictured left is the Old Post Office courtesy of Zaian. Tintagel or Trevena (Cornish: Tre war Venydh, meaning village on a mountain) is a village situated on the Atlantic coast of Cornwall, England. The village and nearby Tintagel Castle are associated with the legends surrounding King Arthur and the Knights of the Round Table. 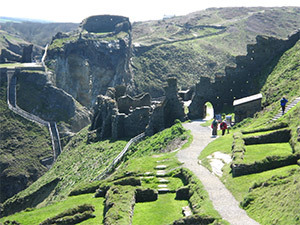 Pictured left is ruins of the upper mainland courtyards of Tintagel Castle courtesy of Kerry Garratt. Licensed under CC BY-SA 3.0 via Wikimedia Commons.